Are money worries causing mental health issues with Millennials? Often portrayed as superficial whiners by the print media for headlines designed to titillate Boomers, Millennials are facing challenges more complex than being the first to get the new iPhone 17. A Global News Ipsos Reid Poll has shown that more than half of Canada’s Millennials are at high risk of developing a mental health issue. They have been shown to be more at risk of depression compared to Boomers and Gen Xers often exasperated by debt problems. When I think of Millennials I don’t think of myself. I think more of my ten year old nephew who gently corrects the way I hold chopsticks and talks nonstop about what he wants to be, how he’s going to do it and current affairs. He can eloquently outline the challenges faced by his transgender friend and gives me some of the most solid advice I’ve ever had. For years I was a wee bit afraid of him because I thought he was some sort of reincarnated genius but then I got to know a few other kids his age and realized that his genius is standard among this group. Because of my experience of Millennials, it’s no surprise to me that they have been identified as more at risk of mental health concerns because this group is not afraid to reveal who they are regardless of stigma. They’re talkers who are not afraid to seek out help. Baby Boomers in particular have been taught to keep calm and carry on. It may be that Millennials are just being more open about their inner struggles than everyone else. I really love dealing with Millennials through my work at Credit Canada. They come to their appointments prepared, open to options and willing to find a solution to their debt problems. They see financial counselling as a way to better themselves rather than a sign of failure. They particularly love the financial coaching. And just as well because they face financial difficulty right out of the gate with the challenge of how much an education costs. Money worries are often cited as a cause of mental health issues. The stress that comes with not having enough money to pay your debts and living expenses can be a heavy weight to bear. This could be another reason why Millennials are at higher risk for mental health illnesses. Saving for emergencies, buying a house, getting married or having kids can be a challenge for this group because these things require financial stability which Millennials can struggle to find given a shaky job market dominated by minimum wage paying, temporary contract jobs. I often hear from clients that they have found out about us through friends and family but when it comes to Millennials they have sought us out. This skill of identifying a problem and seeking out advice should be adopted by us all. 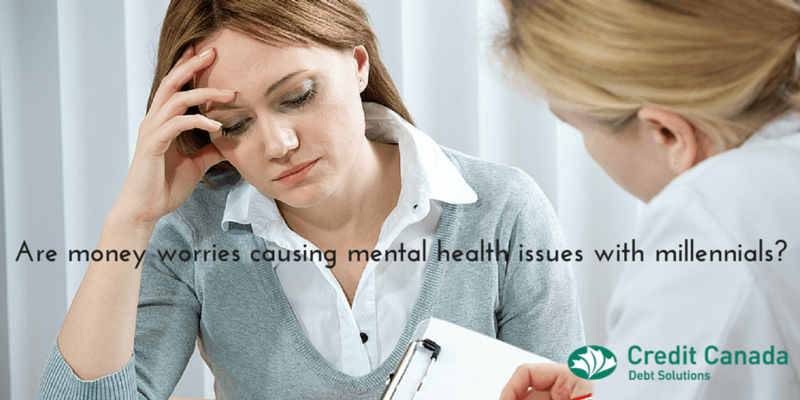 Money worries can be a key contributing factor in mental health issues. If you are facing debt problems Credit Canada can help. If you are struggling with depression or anxiety you can google the Mood Disorder Association of Ontario. They offer many programs including programs for students and young adults.